Info Edge (India) Ltd is one of India's top internet firms with classifieds portals such as Naukri for job searches and 99acres.com for real estate listings. The company ended fiscal 2011 with consolidated net profit of Rs 63.14 crore, up by 21% from previous year over net sales of Rs 321.73 crore. Info Edge recently announced investments into three online start-ups - Rs 10 crore in insurance and loan comparison site Policybazaar.com; $3.5 million in fashion site 99Labels.com and Rs 9 crore in group buying site Mydala.com. In a quick chat with Techcircle.in, Hitesh Oberoi, CEO, Info Edge, spoke about the rationale behind investments, new sectors he is eyeing, over-funding in the sector and innovation in logistics. How are your portals faring and what is Info Edge focusing on this year? We are focused on classifieds business and want to get a good share of the market and maintain it. Monster.com's traffic is half the size of Naukri.com. Timesjobs.com is next. New entrants such as Shine.com are still a small part of the pie. 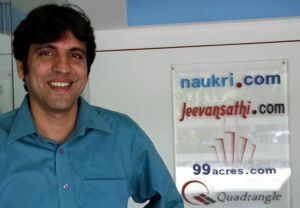 Naukri Premium, which follows the Ladders.com model, currently has 15 lakh jobs. We have not launched it commercially yet and it is still in a beta. There is a lot of development work left. 99Acres is doing well, we have around 17-18 per cent of the market share. Jeevansathi is number 3 in matrimonial space. We have a leadership in the Hindi belt and will focus on maintaining it. We are not planning to invest a lot in it this year. Tell us about the investments you have been making? We are sitting on a lot of cash. Since we have our hands full with our own properties, we decided to help entrepreneurs build companies. We are not looking at financial returns. As you can see we have picked up between 25 per cent to 49 per cent stake in these startups. We're in it for the long run. What are the sectors you are investing in? We are looking at the consumer internet sector. We are also looking at domestic mobile application firms. Globally, sectors such as social, mobile, local - real estate and e-commerce are hot. In India, we have not seen many such investments. But we think local will be very big in India. Are there any plans for consolidation with these startups? We are open to consolidation. Right now, people are going to build. Funding is available to those who have a good idea. International companies will absolutely acquire local players going forth. But some international firms have also exited..
A site that works well in other countries may not necessarily work in India. Though the cost of access is minimal, and there is an opportunity to create new markets. But what they must realise is that e-commerce is a very localised business. You cannot replicate it instantly. It will be difficult for international companies to set up a presence in India as e-commerce is about logistics and sourcing. Are issues in logistics and payment still a hurdle to expansion? Cash on delivery is working. We have also seen that payment companies are innovating and sending people to collect cheques from homes. Payments on IVR is still difficult due to stringent regulations and we are lobbying with the government to make it easier. Do you think there is overfunding in the sector? When a sector takes off, there is bound to be overfunding. People do not know how many categories there are. I'd say one should worry if valuations go out of whack. And are they out of whack? They are high right now. But compared to global sites, they are not out of whack. The spending power and involvement is different for global funds and we do not see that happening here.